Solar System: Uranus. Creation Testifies! Sir William Herschel discovered Uranus on March 13, 1781. It was during his systematic cataloging of binary stars that Sir William Herschel observed a small, light-blue disk. Although Sir William Herschel is considered the discoverer of Uranus, he was not the first person to see it. In the year 1690, John Flamsteed observed Uranus and cataloged it as the star 34 Tauri. Pierre Lemonnier also observed Uranus multiple times in the 1750s and 1760s, but neither he nor Flamsteed recognized the object as a planet. Uranus orbits the sun at an average distance of 1.79 billion miles - over 19 times farther out than Earth. At such a distance, Uranus takes 84 years to orbit the sun. Uranus is four times the diameter of Earth. The outer composition of Uranus is similar to that of Jupiter and Saturn - mostly hydrogen and helium gas, with a small percentage of methane. Based on its density, the interior of Uranus is thought to be composed of various ices such as water, ammonia, and methane. For this reason, Uranus is sometimes referred to as an ice giant rather than a gas giant like Jupiter or Saturn. Uranus has a system of rings that are quite different from the rings of Saturn. Saturn's main rings are broad sheets of orbiting material, whereas the rings of Uranus are more like a series of 13 thin ropes. Each of these ropes encircles Uranus at a discrete distance, and all are in the plane of its equator. These rings were discovered in 1977 when Uranus passed in front of a bright star. Unlike any other planet, Uranus rotates on its side. The rotation axis is tilted approximately 90 degrees relative to the planet's orbital plane. The extreme tilt of Uranus is contrary to the expectations of the secular model of solar system formation. Under a secular model, the planets ought to have formed such that their rotation axis is nearly perpendicular to their orbital plane. Only Jupiter and Mercury meet this expectation. Secular scientists usually attribute the disagreement between observations and their theory to being the result of some giant impacts in the distant past that knocked the planets from their original vertical orientations. Uranus has 27 known moons. Two of these, Oberon and Titania, were discovered by Sir William Herschel in 1787 and are the largest and brightest moons of the Uranus system. Yet, they are less than half the diameter of Earth's moon. The moons Ariel and Umbriel were discovered in 1851, and little Miranda was discovered in 1948. These constitute the five major moons of Uranus. The remaining 22 moons are much smaller, all being less than about 50 miles in radius and generally non-spherical. They were discovered during or after the Voyager 2 flyby in 1986. The Uranian moons are all composed of various combinations of rock and ice. The orientation of Uranus' magnetic field is quite unusual. Most planets have a magnetic field that is approximately aligned with their rotation axis. Not so with Uranus. The magnetic axis is offset from the rotation axis by an astonishing 60 degrees. The magnetic axis does not pass through the center of the planet but is offset to one side by roughly one third the radius of the planet. From a secular perspective, it is mystifying that Uranus should have a magnetic field at all. Magnetic fields naturally decay with time and should be nonexistent in planets that are billions of years old. On the other hand, the magnetic field of Uranus fits perfectly with biblical creation. In 1984, creation physicist Russ Humphreys predicted the magnetic field of Uranus based on the amount of magnetic decay that would have happened on the planet in the 6,000 years since its creation. Voyager 2 confirmed this prediction. Although the presence of a strong magnetic field on any planet is a confirmation of recent creation, this is especially the case for Uranus. 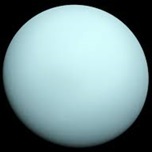 The first planet to be discovered in modern times, Uranus is a diverse world of unique splendor. The properties of Uranus are fascinating and confound the secularists but clearly declare God's glory.